analysis of effective load carrying capacity of a mini-grid in the presence of solar generations and storage to facilitate optimal planning, operation, and efficient power market mechanisms. The main goal of the work is to facilitate the risk mitigation in unit commitment, intermittency of generation, and grid integration, for the experimental solar installations developed in this project. Securing information systems, and critical infrastructures of the nation against hackers, state sponsored cyber forces, cyber terrorists, and cyber activists is critical to the well being of the national economy, progress, and national security. Cyber Security can thus be defined as the technology that defends our information systems and critical infrastructures from cyber attacks of all scales. With the increasing use of computing and communication in critical infrastructures including power grid, industrial automation, nuclear plants etc, and with the rise of technologies such as IoT, and our increasing reliance on e-commerce, electronic banking, protecting confidentiality of data on transit from eaves droppers, and protecting its integrity against man-in-the-middle attacks are national imperative. Nivetti Systems is a company developing a fully indigenous routing and switching equipment using it's next generation Network Operating System 'OmniOS' which has been indigenously developed using a grounds up approach for defense and critical government infrastructure. However, certain technologies such as SSL/TLS, and SSH which are using implemented in most computers these days including routers are usually deployed using available open source implementations such as openSSL, openSSH etc. The project aims to germinate a national knowledge centre for formal methods, targeting recent applications and safety standards in various ICT domains such as aeronautics, automotive, power, nuclear, railway, and space. Objectives include research and development of specific tools and tool repositories, industrial partnership and manpower training. It proposes research centric work packages for developing tools for formal validation of control systems, networked systems, and hardware/software systems. The project also proposes knowledge centric work packages on interpretation of safety standards, processes, and tool flows. It has training centric work packages for developing the ecosystem for safety validation and certification. During a recent cyber security audit of the institutional grade management system OARS, a number of cyber attacks were identified some of which have grave implications. Some of the cyber-attacks were so simple to carry out, that any person without having a password authentication could change grades of students during a certain period during the finals week (Lack of Integrity). Also, the same attacks could reveal grades of students to anyone (Lack of Confidentiality). Further, grading or change of grades are not attributable to any one, thereby making it impossible to find out if a change has been made, and if so, who might have made the changes (Lack of non-repudiation). This proposal aims to create a software system that has a web-based front-end for instructors to enter grades for their courses, the dean's office to create grade reports for students, administrative personnel to update grades when a grade change request is initiated, and students to check their grades. After the Stuxnet worm affected the Iranian nuclear enrichment control system and was later dissected to show that a number of vulnerabilities ranging from the Microsoft operating system to the Siemens applications, firmware, and networking were exploited to slow down the control system or disable parts of the system, in February 2013, U.S President Barack Obama’s executive order on industrial control system security brought the urgency of protecting industrial control systems from cyber-attacks to the public perception. The critical industrial control systems include power generation stations, control centers for utilities, industrial manufacturing systems, chemical processing plants, nuclear plants, and water & sewage control systems and so on. SCADA or Supervisory Control and Data Acquisition systems are crucial part of most critical infrastructure through which sensor data is collected from physical processes involved, control is computed, and control commands are sent to actuators for affecting control on the physical processes. The project focus on the cyber security of safety-critical systems that are used to monitor and control critical infrastructures such as power transmission grid, power distribution infrastructure, substations, manufacturing systems, water and sewage treatment plants, nuclear or other power plants, or transportation systems such as railway networks. With the advent of smart infrastructure which combines the usage of embedded sensors, actuators, wireless and wire line networks, computerized digital control, monitoring etc., the cyber security of such systems are gaining prominence among researchers , industries, as well as governments. With terrorist organizations and other adversaries abound, Cyber-Security is not just a computer science issue but a national security issue. National critical infrastructures are ripe targets for cyber-attacks. A comprehensive cyber-security research and technology transfer program is needed for India. All target systems require protection via detection of on-going cyber-attacks, attribution to sources, and prevention through preemption. Our vision is to become the main center of excellence nationally, as well as one of the major internationally renowned centers in the area of cyber security/defense of critical infrastructures. Our approach is multi-pronged and multi-layer -- defense-in-depth strategy. Starting from crypto algorithms and protocols, side-channel proof crypto engineering to vulnerability analysis of systems and application layer software, network and web security, cloud security through virtual machine hardening, and use of machine learning for anomaly detection to fight persistent threats in the critical infrastructure. Cyber-Physical Systems (CPS) such as a manufacturing plant, a power generator, a power transmission substation are usually controlled by a SCADA (Supervisory Control and Data Acquisition System). Other CPS examples include drive-by-wire automotive, fly-by-wire flight control system etc. Due to the rise of global terrorism, and cyber criminals, these systems are ripe targets of cyber attacks. 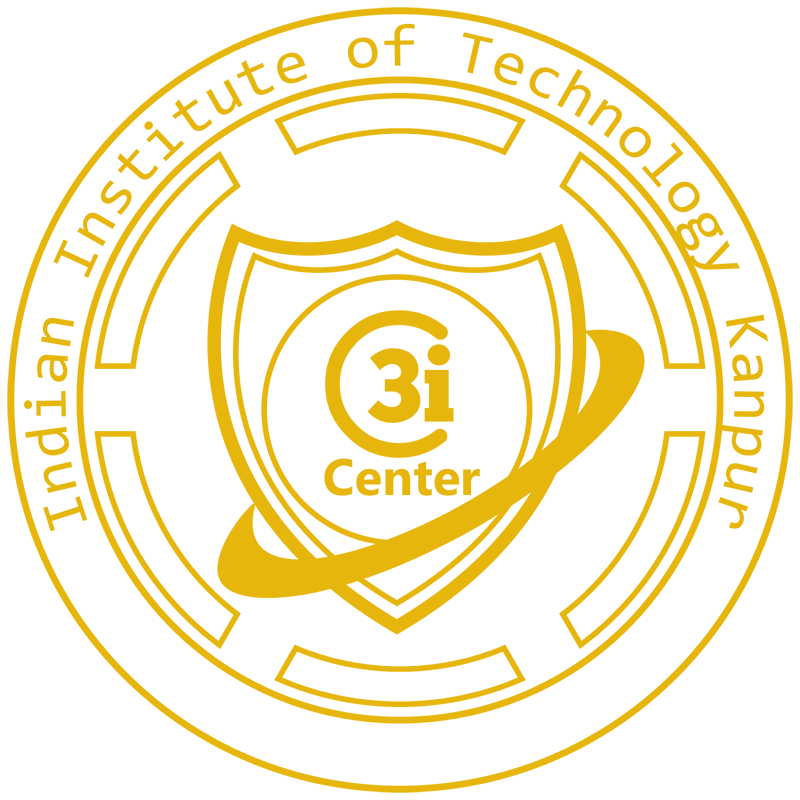 At IIT Kanpur, we are in the process of building a SCADA Cyber Security lab with real SCADA hardware/software/networks as well as surrogate physical plants, to study the cyber threat models, vulnerabilities, and cyber security mechanisms. We are also looking into cybersecurity of general CPS systems. Among the various attack surfaces recognized by the community, the possibility of replacement of previously vetted control software, or other software components in the system by malicious variants by insider attackers is an acute possibility. Recent studies have shown that almost 29% of all attacks are insider attacks. In order to continually monitor the behavior of various software components of such systems, one has to figure out a mechanism in which normal and abnormal behaviors can be distinguished automatically.